Making pageant dresses is not an easy task; however, if you are a skilled seamstress, they do pose an interesting challenge and great opportunity for creativity. The formal gowns worn at pageants require both dress construction skills and an eye for embellishment. Sequins, beads, feathers, ruffles and boning can all come into play when crafting one of these amazing and sometimes over-the-top pageant gowns. 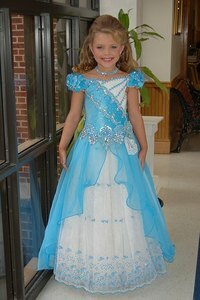 Designing a pageant dress requires that you consider both the pageant guidelines and the age of the wearer. You should choose an overall design that is modest and suitable for a little girl. Consider attending a local pageant. You may find more typical pageant styles or more traditional dresses. If you are starting with a pattern, choose a dress pattern with a fitted bodice and puff sleeve for a young girl. Sleeveless or modest halter styles may be appropriate for preteens. You can also use a spandex leotard pattern as the basis for your pageant dress. Adapt or draft the skirt by adding a substantial amount of fullness and multiple layers of fabric for that all-important pouf factor. Before you start cutting, sketch out the placement and design of embellishments, including ruffles, beads and sequins. Cut and sew your dress. Consider hemming each skirt layer with a rolled hem that encloses a fairly thick piece of fishing line for a cupcake-style skirt. Formal pageant dresses are all about shine and glitter. You can opt for silk or satin for the entire dress, especially if you choose a more traditional style. Many of today's pageant dresses either rely on a spandex bodice or a boned bodice more typical of adult dresses. You may want chiffon, organza or satin for the skirt of your dress. Light nylon chiffon works well for underskirts and pettiskirts for pageant dresses. You may find it helpful to purchase a ruffler for your sewing machine before you start working on a pageant dress. A girl's dress should let her shine and should not overpower her. Keep this in mind when choosing sparkling embellishments for her dress. Lightly applied crystals or sweet satin bows are good choices for very young girls and will create a look of childhood and innocence. Save more elaborate sequins for dance costumes and older girls. You can purchase appliques that will work well on pageant dresses in the bridal or formal wear section of your local fabric store. If you plan to use rhinestones, invest in the appropriate tools to make it easier to set the stones.